Microsoft pitted various browsers against Internet Explorer 11 and claims that its browser is the most energy efficient one on the market, providing superior battery life versus Firefox, Chrome and Opera. Tests were performed on the Toshiba Encore and the Surface Pro 2 using the Peacekeeper battery test. 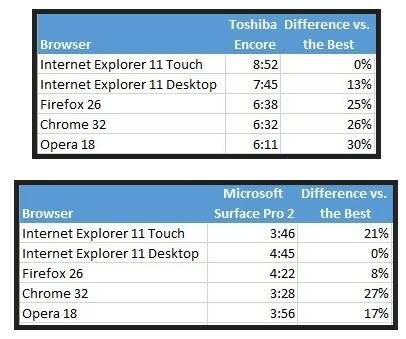 Neowin writes the results of the Surface Pro 2 look a bit odd though, the Touch version of IE11 scored significantly worse than the desktop version of IE11 in this test, likely hinting at more Surface Pro 2 firmware issues that remain to be addressed.